Celebrating 400 views of The Italian South! Thanks to all who have checked it out. I appreciate your comments. 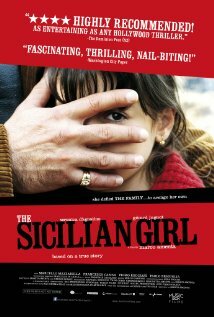 A few days ago I watched the movie The Sicilian Girl, an Italian movie based on events in Italy about twenty years ago. The fictionalized story of Rita Atria, from her childhood in a Mafia family in Sicily, through her turning to the police in hopes of avenging the murders of her father and brother, is told in gritty detail. For one thing, listening to the Italian language encouraged me–I haven’t forgotten everything I ever learned about Italian! To help with what I did forget, it has English subtitles. The story has plenty of tension and action, and provided a different point of view for the events than news reports offer. The conclusion is tragic but satisfying. If you’ve seen the movie (or when you have), share your comments here! Did you like it? Why or why not? And thanks for reading The Italian South. This entry was posted in Italian, Movies and tagged Italy, movie review, sicily. Bookmark the permalink. Win, Thanks for suggesting Tom Hart, but he will need to subscribe himself. I’ll send him the link! It was so pleasurable (is that a word?) to read your synopsis of your pope. Celestino cinque, especially when I can picture you in Sulmona walking the same paths, no doubt. I close my eyes and I can almost smell Sulmona – thank you for introducing me to it. I love the sound of the Italian language. And I don’t even understand most of it! I love it too, Dyana, and many Italian movies have dialogue too fast for me to follow. This one wasn’t too fast, but uses some dialect that was different from typical Italian. I think you would like this movie.